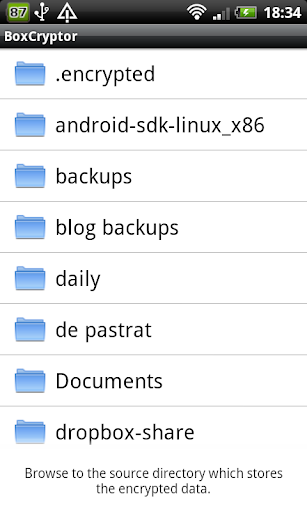 A while back we wrote about encrypting your private Dropbox data using EncFS. And that's a really great way to keep your private Dropbox data safe, but what if you want to access some encrypted files from an Android device? That's where BoxCryptor comes in. 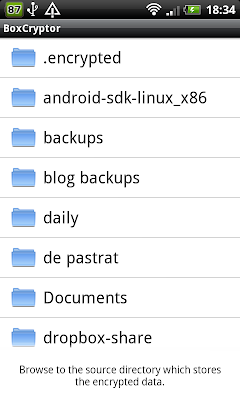 The first public BoxCryptor version for Android was released a few days ago so you can finally access EncFS folders in your Dropbox from any Android device (there's also a BoxCryptor version for Windows and an iPhone / iPad app is currently under development). The application is currently in alpha and for now it can only read encrypted files, but according to it's Android Market page, write support will be added in a later version. BoxCryptor is great, but there are a few quirks. Firstly, BoxCryptor doesn't have full EncFS support so you have to disable some of the default EncFS options to be able to use it (instructions available in the second part of this post). And secondly, in our Dropbox EncFS post, we wrote about excluding the encryption key from getting synced. Well, to be able to use BoxCryptor, you must sync the EncFS key too. Also, the Windows version of BoxCryptor is free for an encrypted directory with a maximum size of 2GB and you must pay for more. 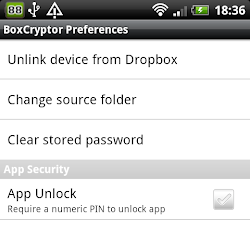 There's nothing about this on the BoxCryptor Android Market page so I assume it's completely free for Android, but I'm not sure, so if you have a large ( >2GB) encrypted directory, let us know if BoxCryptor for Android works for you! But this is the first public release so hopefully BoxCryptor will get full EncFS support by the time it reaches a stable status. 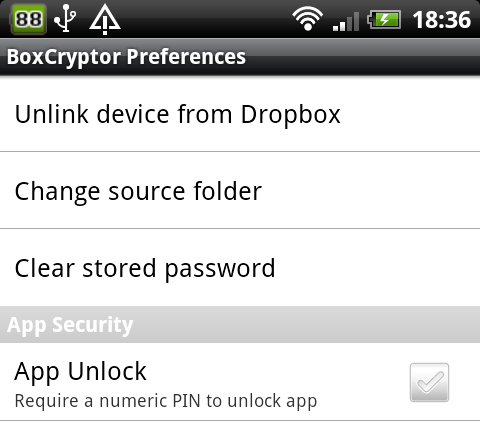 Oh, and BoxCryptor does offer an extra layer of security: you can set a PIN for unlocking the application. Enable block authentication code headers on every block in a file? And finally, skip the last step in our previous post which excludes the EncFS key from being synced. Or use this direct Android Market link.